Water and metal are some of the best conductors for electricity. Because your body is mostly water, you are a great conductor, too! So if you touch an electric circuit and the ground at the same time, you will become electricity's easiest path. Electricity will flow through you, and you could be seriously hurt or killed. 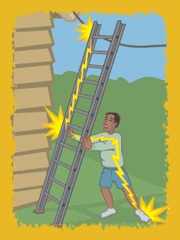 You don't have to be touching the ground directly to conduct electricity. You could also be touching something that is in contact with the ground, like a tree or a ladder.